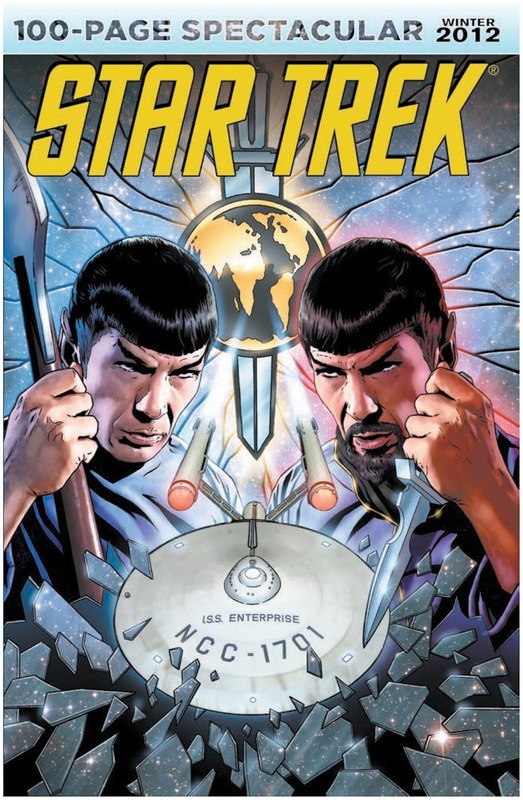 The Fellowship was fortunate enough to obtain a copy of STAR TREK 100 PAGE SPECTACULAR WINTER 2012 from IDW Comics. The stories are by Marc Guggenheim, Ian Edgington, R.A. DeCandido, Scott Tipton and David Tipton. The art is by Andrew Currie, Wagner Reis, J.K. Woodward, and David Messina. In “Captain’s Log: Harriman,” Captain Harriman begins his first (and maybe last) mission as the captain of the Enterprise B since the rescue that cost the life of his legendary predecessor. It doesn’t help that Doctor Leonard McCoy is aboard to aid in the mission, but could he be of some aid to the captain as well? In “Mirror Images,” The I.S.S. Enterprise is raiding the Dilthium Mines of a planet, when the shuttle Bellarmine explodes. Is someone trying to kill Captain Pike? If so, who: Sulu? Scotty? Or is it the man famous for having people “disappear,” Commander Kirk? It’s up to Spock to figure out. And which side is Doctor McCoy on? The art and stories is top notch as always. My favorite is the Harriman story, followed by Mirror Images, Klingons, and then Romluans. This is a treat for any fan of Star Trek. STAR TREK 100 PAGE SPECTACULAR WINTER 2012 is in stores now and available at www.idwpublishing.com.